Need to create Visio flowcharts automatically from Excel? Data visualizer template allows you to achieve this. Currently the feature is only available on Visio Pro for Office 365. 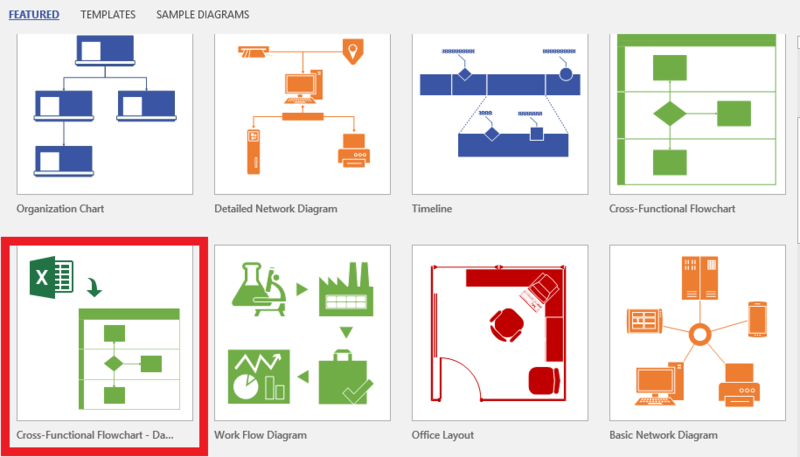 You can even try it out by downloading the Visio Pro trial. If you are not sure if your Visio support this feature or not, select File > Account > About Visio. With data visualizer template, you can use custom Excel template, map Excel data to shapes in the Create Diagram from Data wizard, and automatically create the diagram. The data synchronization two way – meaning can make the changes in Excel and refresh the Visio to see the changes in there and vice versa.